An outdoor sign for your church or school benefits not only the students and members, but the general community as well. Advertise your sporting event or religious school hours with an electronic message center. Let the community know you are there and available for them. Whether you're looking for a changeable message board, electronic sign, lighted sign or something more conventional, let our professionals assist you in choosing the right sign type to best suit your needs. The purpose of these signs is to help people, rather than recruit people, which is often what these signs are associated with. Also, these signs are a way to demonstrate that these establishments are active within the community. Similarly, school signs are equally as important. School signs assist parents, students, and community members alike in keeping up with what is happening on the educational front. School Events – Dances, Dinners, Craft Shows Etc. Let Kerley Signs help create your School or Church sign today! We'll do our best work to help add to the aesthetics of your community while maintaining the ability to keep the members of your community informed on all fronts! 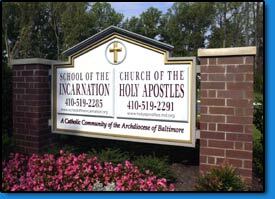 For more school and church sign samples, visit School Signs by Kerley Signs.